The Return to Work scheme provides workers with non-serious injuries with reasonable and necessary medical treatment and care for up to three years. Workers with serious injuries will receive lifetime medical treatment and care. Workers may be referred to an allied health provider for treatment and support to recover from their injury and return to work and life as soon as possible. treatment is based on best available research evidence. We also expect allied health professionals to communicate and collaborate with the worker's case manager, and other treating professionals involved in a worker's treatment and recovery. 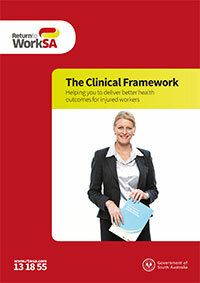 ReturnToWorkSA’s newly revised management plans for Allied Health practitioners are now available to use and can be accessed via ‘Related Links’, found to the right of this page. The management plan is a tool used to summarise your collaborative goal setting and plan of management with your patient, as well as a review tool to track and reflect on progress during their recovery. The revised plans are now only one page in length, with an optional functional abilities recommendations table overleaf. A copy is provided to the patient, case manager and doctor to ensure all parties are aware of treatment goals and timeframes, which can then be included in the overall return to work plan.